Gentle & very effective facial exfoliating grains. 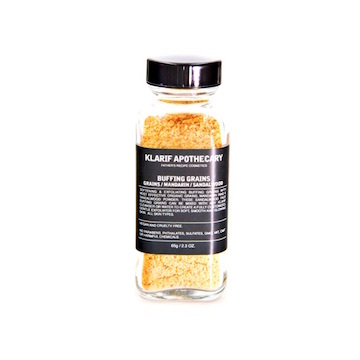 •These sandalwood face buffing grains can be mixed with any Klarif cleanser or water to create a fully customized, gentle exfoliator for soft, smooth and glowing skin. All skin types. •Directions: Gently tap the open bottle to sprinkle grains in the palm of your hand, customizing the amount depending on how your skin feels. Mix in with a cleanser of your choice or water and wash skin as you normally would. Rinse thoroughly. •Caution: Sandalwood powder has a tendency to temporarily dye the skin. Sandalwood Remedy: Discover sandalwood remedies for clear & healthy skin. •Anti-aging Property – The toning effect of sandalwood helps in shrinking skin pores that provides an even skin texture and prevents sagging and aging skin. 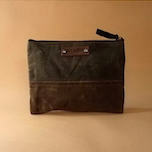 It tightens the drooping skin tissues in order to provide a supple and youthful appearance to the skin. •Skin Softening Effect – One of the most effective benefits is ensuring baby soft skin. •Pimple and Acne Treatment – The powerful antibacterial properties of sandalwood work effectively in fighting the bacteria and fungi and prevents the breakout of pimples and acne. •Itch Relief -Skin itching and infections can be relieved. It also helps in subsiding inflammation, skin redness and sore skin. •Clear Complexion – Clear dark and dull complexion naturally. A daily nourishing moisturizer that perfectly hydrates and nourishes normal, dry and stressed skin. A botanical hydrating dry oil that instantly captures moisture for skin and beard. Fabulous Skin by Morning. 6,000 times more potent than Vitamin-C. Most effective facial treatment w/orange hydrosol for impure skin. Roots by KLARIF Series: Botanical Roots Eye Gel. 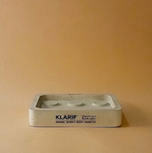 One of the Klarif best sellers to cleanse and moisturize the skin.